Avalanche is keen to release another game, says Xbox Magazine. 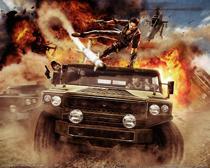 The original 'Just Cause' was a slick game and Avalanche, the game's developers, stepped up big with 'Just Cause 2.' The second game in the series was released a full four years after the first, but it looks like we won't be waiting quite as long for the third. According to a rumor in Official Xbox Magazine, we'll be seeing the third 'Just Cause' game in 2012, just two years after 'Just Cause 2.' Not a bad turnaround. It seems safe to assume that we'll see this one on PC, PS3 and Xbox 360.